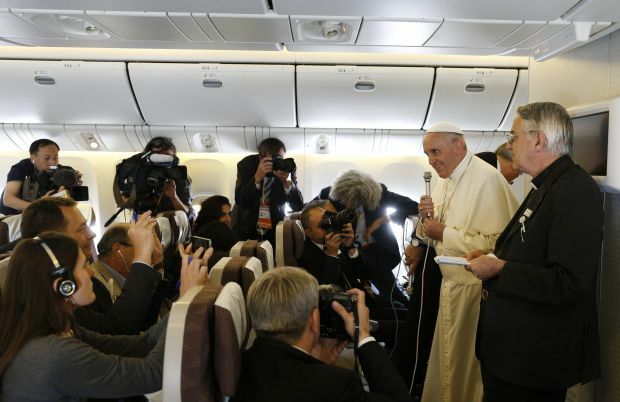 ABOARD THE PAPAL FLIGHT FROM SEOUL, South Korea (CNS) — Pope Francis said the use of force can be justified to stop “unjust aggressors” such as Islamic State militants in northeastern Iraq, but he declined to endorse U.S. military airstrikes against the militants and said such humanitarian interventions should not be decided on by any single country. The pope also said he was willing to travel to the war zone if necessary to stop the violence. 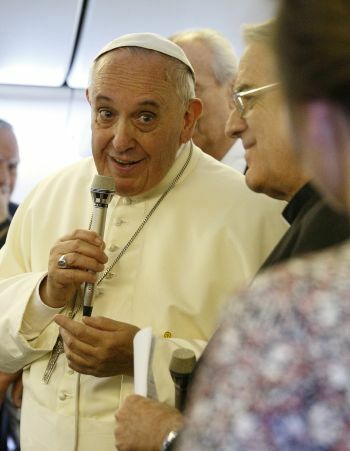 Pope Francis made his remarks Aug. 18 during an hourlong inflight news conference on his way back from South Korea. In response to other questions, the pope acknowledged a need to lighten his work schedule for the sake of his health; said he might make a combined visit to the U.S. and Mexico in 2015; and explained why the Vatican is still studying whether the late Salvadoran Archbishop Oscar Romero should be beatified as a martyr. The pope’s words on Iraq came a week after his representative in Baghdad welcomed President Barack Obama’s decision to use military force against Islamic State positions. That statement surprised many because, since the pontificate of St. John Paul II, the Vatican has stressed that military interventions for humanitarian purposes should have the support of the international community. The pope said his recent appeal to the U.N. to “take action to end the humanitarian tragedy now underway in Iraq” was one of a series of measures he had considered with Vatican officials, including his decision to send Cardinal Fernando Filoni to the region to meet with church and government officials and refugees. Asked whether he was keeping an excessively busy schedule, the pope admitted that “one of my neuroses is that I am too attached to my habitat,” so he has not taken an out-of-town vacation since 1975. Asked about other possible foreign travel, besides officially announced trips to Albania in September and Sri Lanka and the Philippines in January, Pope Francis said he had received invitations to Spain and Japan but that nothing had been decided yet. The pope said he would gladly visit China “tomorrow,” even though the Vatican has not had diplomatic relations with Beijing since shortly after the China’s 1949 communist revolution. The two sides have struggled over issues of religious freedom, including the pope’s right to appoint bishops, and Chinese authorities have frequently arrested Catholics who reject government control of the church. Yet the pope made clear the church should not accept a rigid separation between religion and politics. On four of his five days in South Korea, he wore a yellow-ribbon pin commemorating the approximately 300 people killed in the April sinking of the Sewol ferry, a gesture some interpreted as support for demands by victims’ families that the government appoint an independent investigation of the disaster. The pope said he “would like” to attend the World Meeting of Families in Philadelphia in September 2015. He also noted that Obama and the U.S. Congress have invited him to Washington, D.C., and that the secretary-general of the United Nations has invited him to New York. Asked about the beatification cause of the late Archbishop Romero of San Salvador, an outspoken advocate for the poor who was killed in 1980 during his country’s civil war, the pope said theologians still need to clarify if he was killed because of his faith. Pope Francis also reported progress on a future encyclical on ecology, saying that Cardinal Peter Turkson, president of the Pontifical Council for Justice and Peace, had delivered a first draft just a few days before the pope’s departure for South Korea. The pope said the draft encyclical was about one third longer than his 50,000-word apostolic exhortation “Evangelii Gaudium,” but that it would be shortened by removing the more debatable scientific hypotheses or relegating them to footnotes.